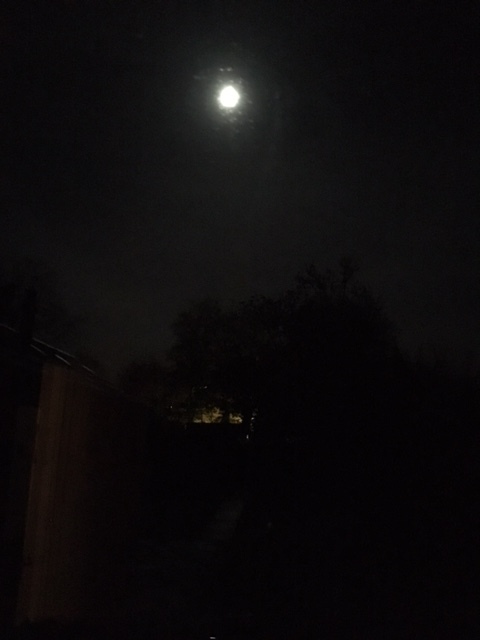 The most recent supermoon has woken me up for two nights running. Technically, it was the morning, the small hours, at around 1am both times. On Sunday morning it felt like a surprise to be woken up. 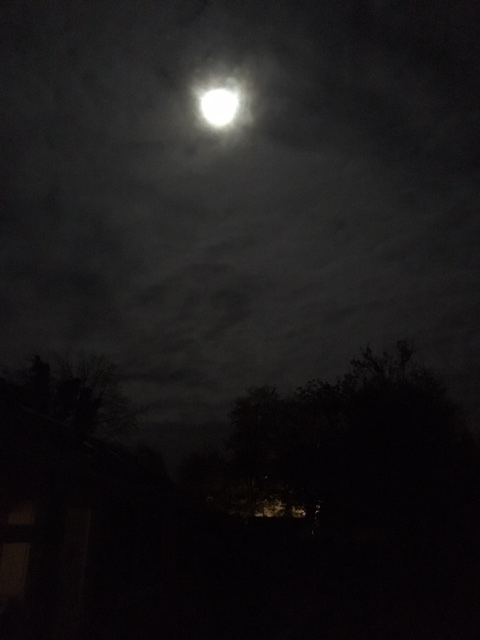 I hadn’t gone to bed thinking about the moon or looking for it but the moon made sure I didn’t miss it. On Sunday evening, I started looking for the moon. The moon was on the radio. The moon was on the news. I wanted to see it. I looked out of every window and I went into the garden, front and back, to try to see it but there was too much cloud. I went to bed at about 11pm but I was restless, thinking about the moon and whether or not I’d miss my chance of seeing it. Perhaps I slept a little. 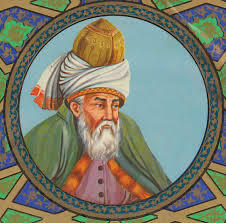 I listened to this wonderful radio programme about the poet Rumi. There are 29 days left to listen on BBC iPlayer. I often listen to the radio through the night. I used to do this regularly years ago when I was single but I’ve tended not to do this since I began sharing my life with my husband, Andrew, over twenty years ago. In recent months, however, I’ve had some difficulty sleeping and I’ve found listening to the radio wearing an earpiece helps me to drift off to sleep and it’s soothing when I’m sleepless during the night. I have a memory of being a small child and, when I was unwell, my Dad making up a bed for me downstairs – it must have been a camping bed, something I’d find pretty uncomfortable these days but when I was much younger I found it very cosy. He made the bed up for me so that he could sit next to me during the night and care for me. I was born after my father contracted a polio-like illness and became disabled so, for nearly the whole of my childhood, I remember him being at home, not going out to work, and sharing household and child-rearing responsibilities with my mother. Listening to the radio through the night is a bit like having someone sitting next to you and caring for you. There’s no judgement if you drift off to sleep and they are still there each time you wake up. After Rumi, I became aware of light filling our bedroom. I came downstairs and opened the curtains of the room I usually write in. There were squares of moonlight on my striped rug. It seemed as if the whole house and garden were lit up. Our long garden path was clearly visible. I had a sensation of needing to be active and thought about going outside but resisted. Tiredness claimed me. I disturbed Andrew as I climbed back into bed. This morning I woke at around 6am. I could hear Andrew moving around downstairs, opening the door to the understairs cupboard where we keep our shoes and outerwear, zipping up his coat. I heard his shoes walking across our wooden floorboards. He was getting ready to leave the house, to catch an early train to London where he works most weeks. A cup of tea he’d made for me was next to our bed but it was already tepid. I came downstairs to say goodbye. “Did you see the moon, then?” he asked me. Tonight the moon is going to be even bigger and brighter, I’ve heard. 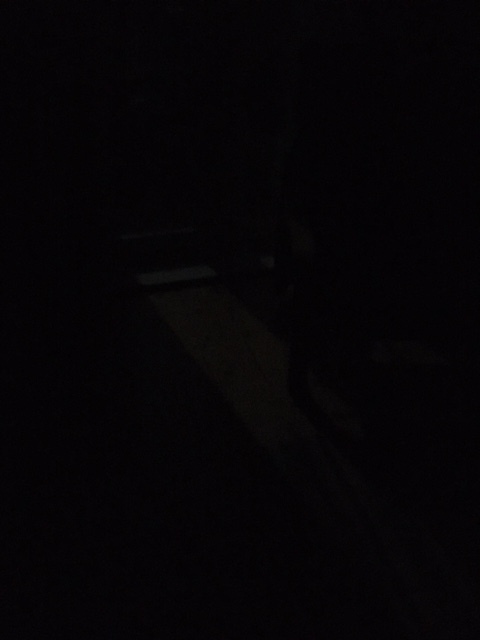 I was outside the back door last night after 11pm taking photos too. They’re not that great. Maybe tonight! I’m making a note to leave the bedroom curtains open tonight. Lovely post, Josephine. It was too cloudy here to see the moon last night, but I love gazing up at it. I’ve never managed to take a photo of the moon that does it justice.